With its easy 1, 2, 3 steps you create a filling and healthy lunch that fits your specific craving. First you pick the style (wrap, salad or plate), then you pick the protein (falafel, chicken, steak, salmon, etc.) and lastly you pick from the seasonal sides (like potato salad or slaw). Right in the middle of what’s beginning-to-be the “IT” part of town- Culver City. Let’s hear a “holla” for Yalla!! This local spot smokes their meats almost as good as the South, and that’s more than good enough for us in a region of mediocre BBQ. It’s a little pricey, but the quality and flavor, of the meats specifically, are exactly what you’d expect from a Bazaar and ink. alum. The portions aren’t as big as you’ll find in Texas, but it had to conform to some Los Angeles standards. With locations on the East (Silverlake) and West (2 in Culver City) this quick and DELISH go-to vegan and vegetarian Indian food jaunt is where it’s at. A family-owned authenticity you can feel and taste. A seriously cheap-eat (you can get a 3 item plate with pita for under $10) in a city filled of expensive “fast-food” options. If you’re craving the real deal without all the fanciness, the search ends here. Even though Pita Bar & Grill is located on one of the worst streets to find parking, you CAN’T KEEP US AWAY. The unique Shawerma (it’s chicken fyi, with hints of cinnamon) & homemade hummus… the fully-stocked, unlimited & complementary pickle and sauces bar… AND the refreshing Aquas Frescas (ya they have a “juice bar” too), this place had me [Alex] going back twice in one week. Insider’s tip: for a towering, food falling off the edges of the plate experience, get it “for there”, eat whatev, and then pack the rest “to-go”… it’s just as perfect the next day. “POKE” is the Hawaiian word for cut, cubed or sliced raw — and you’ll be seeing that word (often associated with fish) all around town. This W. 3rd St. spot lets you build your own bowl or choose between their completely perfect pairings (IF you can handle the heat, the That Fire! was a fav). If you’re looking for a healthy, light and fresh-as-it-gets quick meal your prayers have been answered. It’s pretty much the Chipotle of poke shops… proving that dreams do come true. 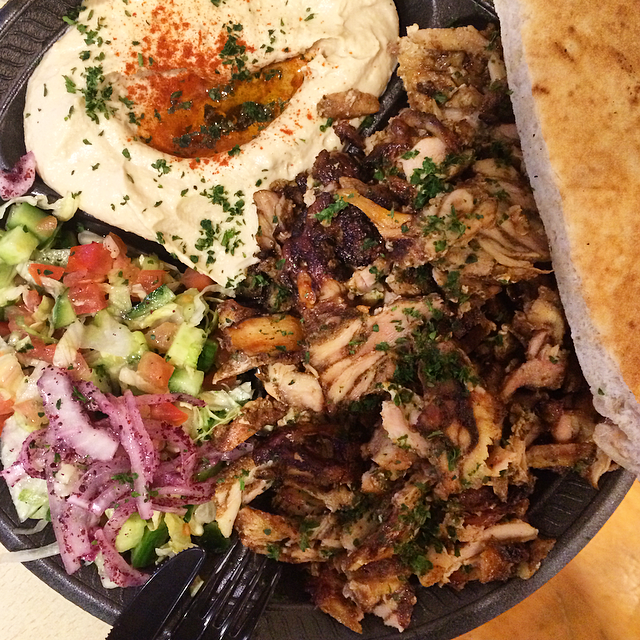 Pingback: Get Out Of Town: Austin + Pita Bar & Grill | eat.drink.dish.repeat. 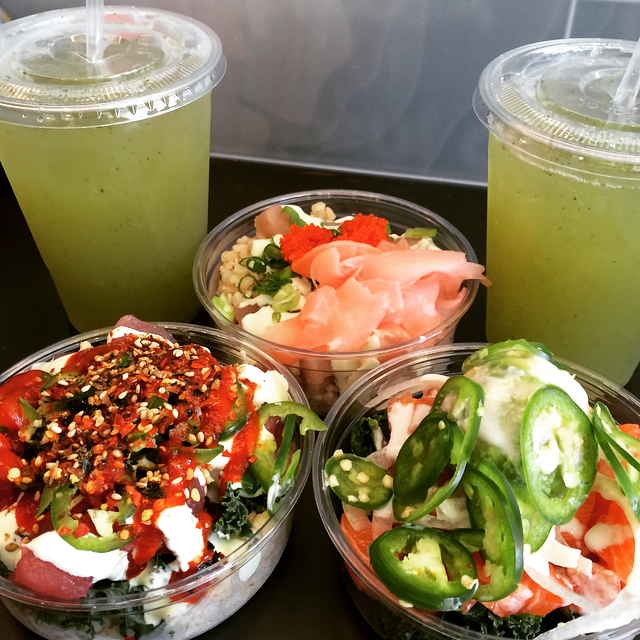 Pingback: Quickie: Mainland Poke Shop | eat.drink.dish.repeat.